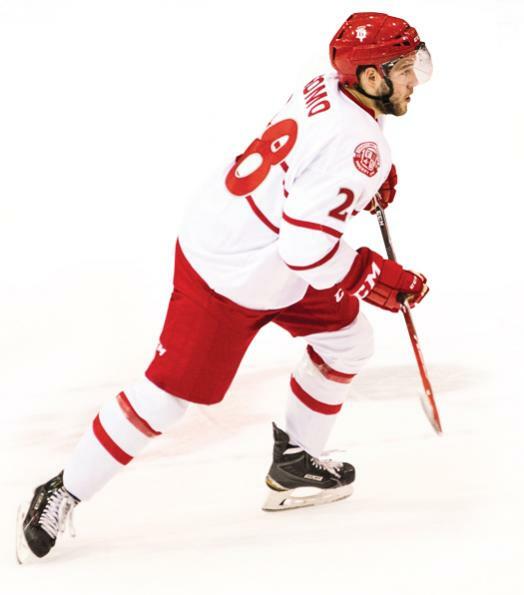 Jakob Romo was well on his way to earning a roster spot with the Dubuque Fighting Saints after leading the team in plus/minus and holding a share of the team scoring lead in the preseason. But things quickly began to unravel when the undrafted forward from Fullerton, Calif., hit his head on the ice during an exhibition game. Eager to get back on the ice, Romo tried to return to physical activity before feeling completely symptom free. The result was that he ended up sitting out the entire 2014-15 season, and didn’t feel right until the following spring. Hockey has made great strides when it comes to diagnosing and treating concussions. It starts with changing the mindset that playing through the hazy pain of a concussion is the macho thing to do. Or that sitting on the sidelines is in some way letting your teammates down. Romo knows firsthand that neither belief could be further from the truth. Romo remained in Dubuque for several weeks after the injury before eventually returning home for the remainder of the season. “It was really frustrating being around the guys and having to watch them do everything. And it was really frustrating to be back at home instead of with my team,” says Romo, who dealt with a lower body injury to begin this season. Checking a player for the signs and symptoms of a concussion can be a tricky thing, especially in the heat of the game. That’s why the Reston (Va.) Raiders are among a growing number of youth sports teams that are taking the guesswork out of the process by using the King-Devick test. Validated by Mayo Clinic researchers, the King-Devick test is an easy-to-administer, vision-based test that evaluates rapid eye movement, vision and attention, all of which can be affected by concussions. 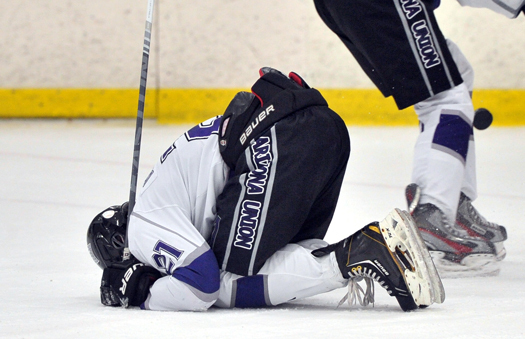 “For us, the test is quick and objective, and players who might otherwise hide symptoms cannot hide a failed King-Devick test score,” says Kaki Schmidt, hockey parent and Safety/Concussion Program director for the league. After suspected head trauma, the athlete reads single-digit numbers displayed on standardized test cards. The results are then compared to the individual’s previously administered baseline test. If the time needed to complete the test takes longer than the baseline, the athlete should be removed from play until evaluated by a medical professional. Detecting a concussion on the sidelines and removing an athlete from play can assist in minimizing the effects of an injury and help prevent an athlete from suffering a second and more serious concussion. “Youth athletes are at a higher risk for concussion and a longer recovery time than adults,” says Amaal Starling, M.D., Mayo Clinic neurologist. Most importantly, Starling says, the test is affordable and can easily be used by any youth sports league, and administered by non-medical personnel. “The King-Devick test represents a rapid, accurate and cost-effective tool to identify a potential concussion on the sideline and make appropriate game-time, remove-from-play decisions,” she says. For the Reston Raiders, any player who fails the King-Devick test at injury is immediately removed from the game. And according to Schmidt, 80 percent of players failing the King-Devick test who go for medical evaluation are diagnosed with a concussion.